Have you ever been in a period in which you’ve discovered a new thing or have tried a new recipe and then you find yourself eating the same dish for over a week? I am sure there are a lot of you out there going through what I would call “RDS” which stands for “recurrent dish syndrome”. It affects more people than you might think: men, women; who share this, so unexplained obsession with food and found themselves trapped in the excitement of discovering something they have never tried before. Although RDS is known for its damage to the creativity and to the senses, no cure has been found yet. The only remedy for it is time and weariness. If I had to count how many times I experienced this syndrome, I would be ashamed of my self. Well…if you insist. I had the chocolate mousse episode (my hips still remember it), the chicken wrap episode, the stir-fry, the Asian cuisine, the crème brulee and lately I am in the Macaroon episode. 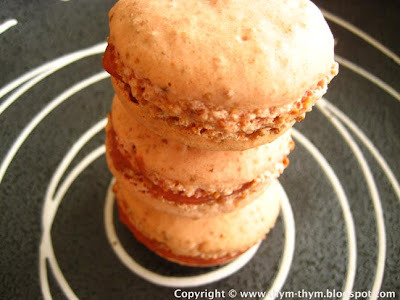 The macaroon episode started about a month ago after my husband tried the recipe, with I must admit great success. Since then, I’ve been thinking about the different combinations and the different colors that I can use for my first, and certainly not last, macaroon experience. I wanted the macaroons to be pink, like candy pink, but when I popped the sheet pan into the oven they became dusty pink. I think I should have added more drops of red food color to the meringue. The recipe is the same as the first; I just used ground almonds instead of ground hazelnuts and colored the meringue with some drops of red food coloring. You can color you macaroons with any color you crave. For the filling I went with a more refreshing one instead of the Chocolate Ganache. -The zest of 1 blood orange and the juice of 3 blood oranges. Grate the zest of one blood orange and squeeze the juice of 3 blood oranges. Place them in a sauce pan with half of the 2 1/3 oz sugar and the butter, and bring to boil. Meanwhile, beat together the eggs, the egg yolk, the cornstarch and the remaining sugar. Pour slowly the hot blood orange mixture over the eggs mixture while stirring. Put it back into the sauce pan; bring to a boil and cook, uncovered for 2 to 3 min while stirring constantly. Transfer the orange cream to a bowl, cover with a plastic wrap tightly touching the surface, and place it over a recipient full of iced water. Refrigerate until cold and slightly firm. -Le zest d’une orange sanguine et le jus de 3 oranges sanguines. Raper le zest d’une orange sanguine et presser le jus de 3 oranges sanguines. Les mettre dans une casserole avec le beurre et la moitie du sucre en poudre et porter a ebulittion. Entre temps, battre les oeufs entiers, le jaune d’oeuf, la maizena et le reste du sucre en poudre. Doucement, verser le mélange chaud de l’orange sur celui des oeufs tout en remuant. Remettre sur le feu et porter a ebullition sans cesser de remuer pendant 2 a 3 min. Mettre la crème d’orange sanguine dans un bol, recouvrir de film alimentaire; celui-ci doit toucher la surface de la crème pour eviter qu’une couche se forme. Poser le bol sur un recipient remplie d’eau glacee et mettre au frais jusqu’a ce que la crème refroidisse et devienne un peu plus ferme. This is something i would like to try one day. When i'm feeling a lot braver. If my macaroons turned out as good as yours look, I'd want to eat them every week too! Doh..for some reason I can't view your pictures...probably a 'work thing' grr! Pink macarons? That is about as unique as it comes! Just a quick note to comment on the beautiful photography and my appreciation of the French portion of your recipes. I think it is so fantastic to see young bloggers like myself, so deeply interested in food! If you get a minute, check out my blog. I couldn't figure out a way to contact you directly. Great work! Thanks Mae for your sweet message. You should really try it; it's not as much difficult as it looks. The secret is to be gentle with the egg white. Thank you Kristen, I am really addicted to them. Jeff, you are always welcome to come back later. Sandi, I love everything that is unique. Thank you very much David for your nice message and I will definitely visit your blog. 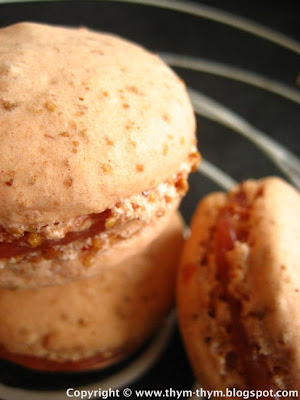 tres beau macaron et comme je suis accro à l'orange sanguine , je note la recette de ganache de G.Mulot . Lili, Tu devrai l'essayer au plus vite car la saison des oranges sanguines est bientot terminee. si cela t'interresse ,j'ai publié ce samedi un gateau à l'orange sanguine et lavande .